I purchased directly from the company and posted this to Amazon as well. This little project started over 3 months ago. Helping my daughter by trying to be self reliant in changing a tire by herself and to simply rotate the tires. Yes you can pay people to do this but that’s not the point Had some significant trouble with all the lug nuts (over zealous tire monkey with an 800 foot pound torque impact gun, salty northern climate and a wonderful Chrysler product) until I reached yes the last lug nut. In my haste I did not have a good bight on the lug nut when I put the cheater bar on (impact wrench and baby compressor would not budge) and I unfortunately pulled the outer jacket off the lug nut. Things went downhill from there. Could not find a 1/2 drive socket that would work and rounded the nut. Broke 3 crappy 3/8 ratchets and a breaker bar using a 3/8 gripping socket. 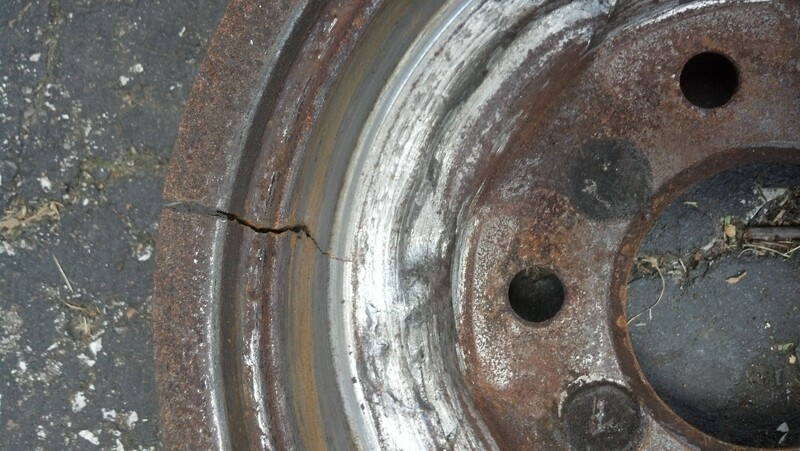 Tried heat, big/bigger hammer, magic penetrating fluid, prayer, cussing, drilling the stud, watched every U-Tard video and even hoped the inspection mechanic would pull the wheel during state inspection. Stubborn male pride thing and fear of getting charged $500 for a $2 wheel stud. Purchased the lug ripper as a last resort so at 7pm in the driveway in the snow and an unhappy daughter as the water tender I was able to get the SOB off!!! I followed the directions except I did not use the recommended air drill, I used a heavy duty 1/2 electric drill set to the recommended RPM and went at it very slowly taking plenty of time. I did reach a point where I thought I was not going to get it off and chew into the rim but we were in it this far lets push on and then suddenly a little pop and the remainder of the nut was off. Theoretically replacing the stud should be pretty easy. Remember folks carbide is brittle and the alignment sleeve is hardened so follow the directions and it took me about 15 minutes because my water tender was getting cold and having a hard time supplying a steady water flow (hint hint the water bladder they offer would have been easier). If you’ve reached the point of no return this product will work. I work at a shop in Madison Wisconsin. I purchased your Lug Ripper from my Mac tools guy thinking I wouldn’t ever need it. 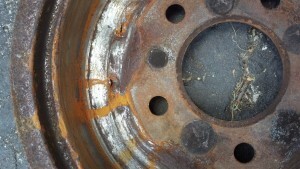 Low and behold 2 days later a car came in that the tin cap had corroded and was swollen. Customer had tried to remove it and damaged it more. 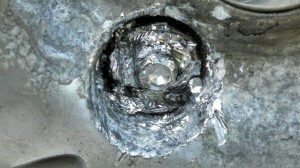 Another technician was given the job and he wrecked it even more. I was called over to assess the situation. I did have this new tool. Out came the Ripper. 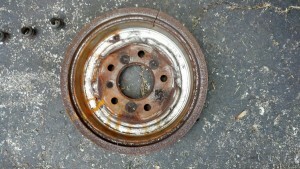 In 5 minutes the nut was off and we were on our way to a successful repair with no damage to the custom wheel. 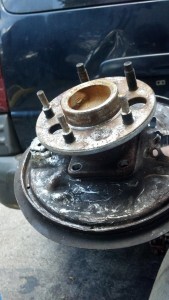 Similar situation happened a few days later but was a locking lug that was stripped out. Once again out came the ripper. My boss now has bought one for the shop to use. Love your tool. The lug ripper is great had a Mazda 6 come in with a stripped lug with aftermarket wheels and used this to remove the damaged lug. Very useful. I am a mechanic. I didn’t have time to put my wife’s snow tires on. 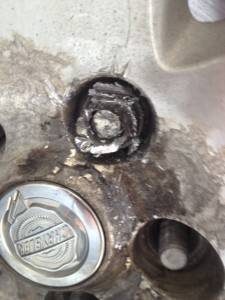 Took it a place to have it done they said the locking lug nut stud was spinning. I said to them what are you going to do? They said cut it off with the torch. I said to put it back together and I will get it off. Talked to my Snap-on guy he said I got just the thing. I bought the Lug Ripper from him, took it home hooked it up and in 15 to 20 minutes it was off with no damage to the rim. I love the Lug Ripper. I have let a few of my fellow mechanics use it and they love it. I bought this to get a wheel off a Jag that other shops could not without destroying the rim. It works flawlessly and outperformed my expectations!!!!! And by the way my expectations are its perfect. 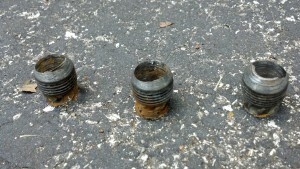 I own a garage in Pennsylvania and I was working on 03 Dodge Neon with Chrysler’s tin capped lug nuts. I drilled 3 of these with a regular drill bit that my Snap on tool rep showed up and he had the Lug Ripper on his truck. I had seen ads for it so I bought it and it’s awesome turned a 4 hour job into a 30 minute job. The Lug Ripper is well worth the cost just in time saved. It really works, well worth the money, but suggest using a corded drill, overheated the Dewalt and a Snap-on but either way works awesome. I borrowed the Lug Ripper Kit from a friend of mine to work on the lug nut that I could not get off. I broke it, torched it, tried everything to get it off, see photos. There was nothing to hold onto with the guide, so I straight drilled using the drill bit only and was able to get the job done. Thank you Lug Ripper ! 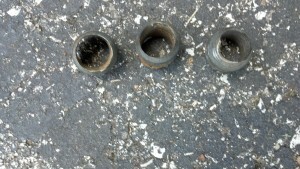 aftermarket lug nuts on so tight that everything we tried to remove them stripped. least 18 studs before it started getting dull and had to order another bit. Today I received this photo with a question do you think the lug ripper can rip this lug? I’m wondering if the lugripper will work for the lug that is seized on here. As you can see, my attempts to remove it have not been good and it is actually much worse than you see in this picture as I continued to back at it to get it off. I have the metal of the nut down past the lug bolt now. 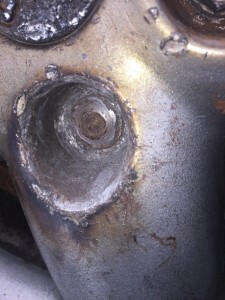 So, I think your tool would have to drill out the bolt also (which I can replace). Please let me know what you think. Thanks! Wonderful tool.Super fast shipping. LugRipper.com website has video links to see this tool in action with the proper use of the tool.It is especially useful with aftermarket wheels when the lugs are close to the lug nut opening (meaning the surface of the wheel)and does not extend far enough to get another style left hand thread removal tool onto the lug. Hello, I just got beat by a stripped lug nut today and I did a web search. I wanted to know where I can get a tool. I am in Baltimore, MD. I have mobile tire shop and this tool looks like something I need in my toolbox. I just ordered. I hope this tool works. I ordered the locking lug removal tool as well.I have the Sunex tool that suppose to remove locking lugs and to be honest, I could never get that to work on anything. Hello,I got the lug ripper today. I wanted to use it on the job we messed up but the only thing is we really hacked up the lug and stud. We were trying to chisel it off. I’m not 100% sure one of the sleeves will fit over the messed we left but if it .does can I use the lug ripper? Once again I would like to thank for your support. I am really impressed by your super quick turn around time for delivery. I thank you taking time out of your busy schedule to call me to provide some guidance on how to use tool. The tool work like a charm as it cut through the like it was nothing. As your direction mention, I used study pressure. Our customer was very happy. I did charge him anything as it gave us the opportunity to use the tool. I am sorry I did not think to take pictures. 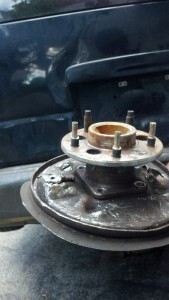 I have a 2003 Mitsubishi Galant, the dealer who replaced my tires used a 1” 5000LB torque wrench. When I went to remove one of the tires I snapped the splined lug nut at the bevel. I have 3/16” clearance only and am perplexed on what to do. 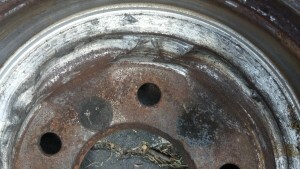 The dealer wants to use a torch to blow out the stud and lug, but I am worried they will destroy my rim. Will your tool work for this? I received the Lug Ripper late yesterday and found all three collars are “Too Large”. Can I go after the recessed nut alone with the machine bit, or is this not adviseable? I left your number at work and could not call last evening, although it was already 5:05 PM-PST. I need to get this done this morning, I hope you receive this and can call me to advise. Thank You! I called him and it worked perfectly, he was and is very happy that we could help save the day. Hello my name is Terence Garth and I would like to take this opportunity to tell you about an experience that I just experienced recently. My nephew called me and asked me about how to remove 3 lug nuts from his right rear tire because he was only capable of removing 2. So, after telling me of all the tools he had broken attempting to remove the lug nuts, I suggested he drive the vehicle to my location so, that I could evaluate the situation. Before I focused my attention on the tire, I made several attempts to loosen or remove the nuts using a breaker bar, an impact wrench, and heat but when none of these methods would not work I noticed the rim was tightly snugged against the drum, I then jacked the rear of the vehicle and observed that the drum was anywhere from 3 to 5 inches away from the backing plate. Instead of my nephew acknowledging that he had a problem with his rear wheel which he continue to drive until his problem became a serious problem. 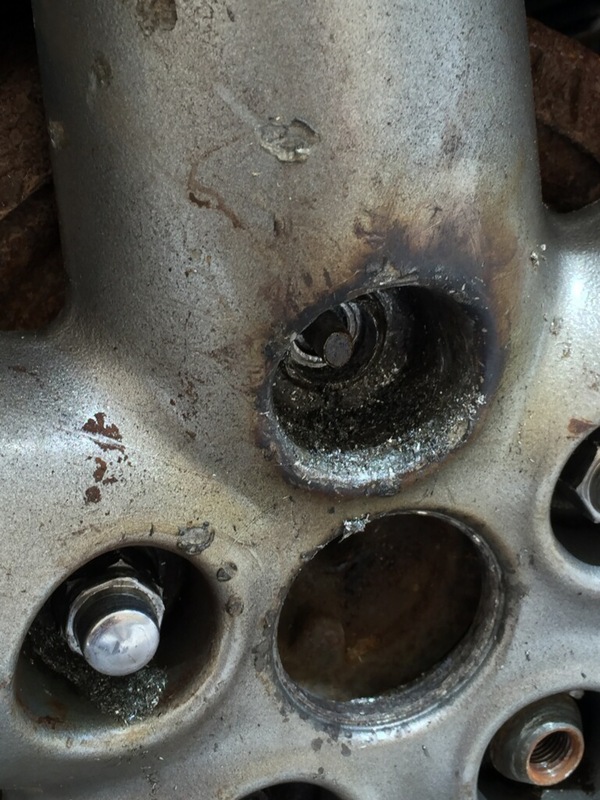 After my failed attempts at removing the lug nuts I decided to turn to the internet to find something to remove these completely rounded off and seized up lug nuts. I come across a tool that instructs you to place the tool on the rounded off lug nut clockwise and as the tool was turned counter clockwise the tool would dig deep into the lug nut. I moved on from that tool because that was a waste of money waiting to happen. That’s when I come across the Lug Ripper and watched the video and knew this the tool I need I must admit there was some apprehension after seeing the price, but I knew this tool would work so, I called my nephew and received the ok to purchase the Lug Ripper. 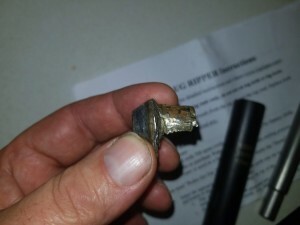 I contacted No Monkey Business, LLC an Authorized Distributor of the Lug Ripper and received my product within 1 to 2 business days which allowed me to start drilling the lug and stud out to remove the tire and drum. In the process of removing the lug nut I could feel the Lug Ripper compensating for the bent stud and lug as I steadied the low-impacted drill. Unfortunately, it took me two and half days to remove 3 lugs due to the small compressor tank I own, but nevertheless they were removed. 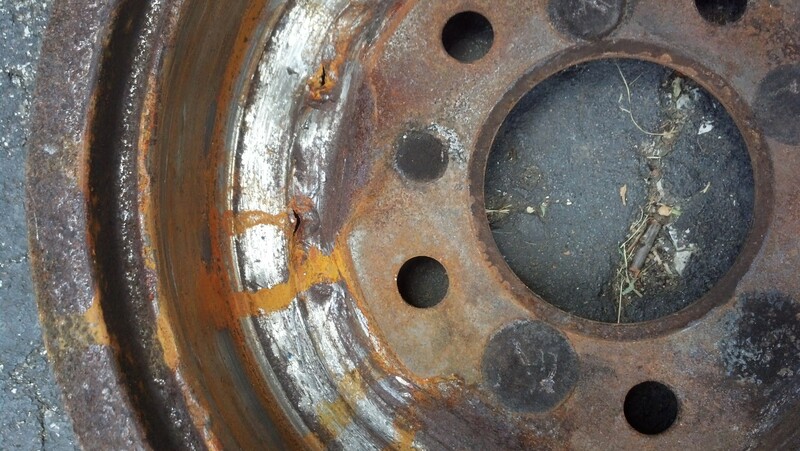 Once the lugs were removed I had to use a sledgehammer to separate the tire from the drum, but when I hit the tire it dislodged the tire and the drum from the hub. This is one of greatest new tools that I have seen for awhile. This is a must have tool if you work on cars in a shop. A huge time saver to say the least. Thanks guys! ————————————————————————————————————————————————————————————————We are mobile and we specialize in Emergency roadside assistance, automotive lockout service, tire change, wheel locks removal service, stripped lug nut removal service, battery jump start service in Charlotte, NC we deal with lots of seized or stripped lug nuts but we use those twist lug nuts and reverse thread lug nuts. Found out about your product while doing research about other methods and came across your product. I saw your demonstration video and loved it will like to give it a try in future jobs I like the technology of your product. Cesar L.